Frontiers Magazine | On earth as it is in heaven – was Orion linked to Orkney’s Neolithic heartland? If there is one constellation that dominates an Orkney winter, it must surely be Orion. Orion over the Ring o’ Brodgar in January 2005. Even to those not remotely interested in astronomy, this pattern of stars is one of the most striking and recognisable in the night sky. Four bright stars form an hourglass shape around Orion’s “belt” – a band of three stars forming a straight (or almost straight) line. As a child I took pride in being able to point out Orion, and, even back then, recognised the fact that it was a winter constellation. When Orion was high, you knew that Christmas was nearby. The constellation returns to the sky in late autumn, at which time it doesn’t rise until after midnight. But as the days shorten, Orion’s appears earlier and earlier and by midwinter dominates the southern sky. He remains visible until early spring, his disappearance coinciding with the return of life and light to the islands. I had often wondered whether the constellation had any significance to our ancient ancestors – but, knowing how these theories can often raise the bile of academia, left it well alone. Then, I heard about a site in England that had hit the national news headlines because it was under threat from industrial quarrying. The 5,500-year-old Thornborough Henges, in North Yorkshire, had been declared to be the world’s first monument aligned to Orion. At the head of the research was the eminent archaeologist, Dr Jan Harding, senior lecturer at Newcastle University. He claimed that using 3D computer models, he could show the site had a number of stellar alignments. But above all this, what really caught the media’s attention was the similarity of the placing of the three great henges on the landscape and the three stars of Orion’s Belt. In addition, archaeological work at Thornborough suggested that Orion was significant prior to the construction of the three henges. The first major monument on the site was built around 3,500BC. This was a 1.2km-long processional way, aligned so its western end pointed towards the mid-winter setting of Orion. This also meant the eastern end aligned to the midsummer solstice. Then, around 3000BC, when the three henges at Thornborough were constructed, they appear to have been deliberately laid out to mirror Orion’s Belt. Not only this, but their southern entrances framed the rising of the bright star, Sirius, which in turn meant their axis aligned on the midwinter solstice. In an article at the time, Dr Harding explained: “Thornborough was a sacred landscape, a place of religious worship, and we should try to interpret these astronomical orientations within that context. Professor Clive Ruggles, author of Astronomy in Prehistoric Britain and Ireland, was not so convinced by the Orion’s belt layout of the henges. He did, however, concede that it is plausible that the rising of the stars, in relation to the local landscape, may have been significant. So what does this have to do with Orkney? As mentioned above, I had always wondered about the layout of the three henges in Orkney’s World Heritage Site – the Standing Stones o’ Stenness, the Ring o’ Brodgar and Ring o’ Bookan. The distance ratios between Bookan and Stenness fit perfectly, although the middle star is slightly out over Brodgar. This is not that surprising, however. If the layout is not mere coincidence, the prehistoric observer could reasonably measure the distance ration between the stars, but not the minute angle involved. But even if we accept that the layout of the three Orkney henges is pure chance, it could still be argued that their siting was significant to the appearance, and movement, of Orion in the winter sky. From the Ring o’ Bookan, looking down across the Ness o’ Brodgar, the Stones o’ Stenness are almost exactly south-east (actually a few degrees to the south). A prehistoric observer standing at Bookan, at midwinter, would see the giant Orion rising over the Stenness monument (see illustration right). So, for example, were we sitting at Bookan at midwinter 2500BC (which by our calendar would be January 9), Orion’s belt would appear above the south-eastern horizon, in the gap between the Firth and Orphir hills, around 4.30pm. Orion’s rising would be followed shortly afterwards by the appearance of the star Sirius, one of the brightest objects in the night sky. The constellation would then move across the top of the Orphir hills, at an altitude 11 degrees lower than today, before setting again just after midnight. Where Orion, and Sirius, sets is also interesting. The constellation would have slipped behind the Hoy hills – approximately 23 degrees further west from the spot the midwinter sun had “died” earlier that day. Was it this noticeable correlation with the movement of the midwinter sun that may have marked Orion as significant? Nobody argues about the connection between the winter solstice sun and Maeshowe, for example, but Orion not only sets in the same area as the winter sun, but it rises in the same area too – in effect it could be seen to be following the sun. Classical mythology depicts Orion as a hunter, trekking across the night sky followed by his faithful hounds. But what, if anything, did the group of stars represent to the early Orcadians? Was it seen as responsible for the annual death of the sun? A fearful entity who’s eventual demise marked the return of life and warmth to the land? Or was it a valiant consort, or ally, of the dying sun, whose sacrifice ensured the return the light? In late 2006, I came across an intriguing possibility in a new book on Stonehenge. In his book, Stonehenge: The Biography of a Landscape, Professor Timothy Darvill, head of the Archaeology Group at Bournemouth University, outlined his theory that Stonehenge was an oracle and a centre for healing – not just a place for the dead, as is believed by many scholars. The basis of his theory lies in the Preseli Mountains in Wales, 250 kilometres away from Stonehenge, and the source of the monument’s massive bluestones. Professor Darvill is firmly of the opinion that the monument was believed to be at its most potent in the winter, when it was “occupied” by a prehistoric god. This god, he suggests, was the equivalent of the Greek god of healing, hunting and music, Apollo, whom Greek myth tells us “chose” to reside in the north – in the land of the Hyperboreans – for three months each winter. According to the Roman writer, Diodorus Siculus, Britain was inhabited by the Hyperboreans and was the birthplace of Apollo’s mother, Leto. Did Orion represent this ancient prehistoric god? A deity who presided over the darkest time of the year? It is interesting to wonder whether Maeshowe’s midwinter alignment, when the light of the setting sun shines into the main chamber for a few days around the winter solstice, could have marked a time significant to this god. And if so, and following Professor Darvill’s Stonehenge theory, was the Brodgar complex also a pilgrimage site – visited by those wishing to commune with the god(s) and perhaps seek cures for their ailments? The healing aspects of the Orcadian stone circles are well-known in more recent history, in particular the connection between the rings and the nearby well at Bigswell. In addition, there at least six wells survived on the Ness o’ Brodgar into the 1800s – and at least one of these is said to have had healing powers. Those seeking cures at Bigswell were plunged into the well’s cold water before being bound to a nearby post and left overnight. A secondary element of the healing rituals involved the Odin Stone – the holed-megalith that was also renowned for its magical cures. How ancient these healing traditions were is open to debate, so, once again, we can only speculate. 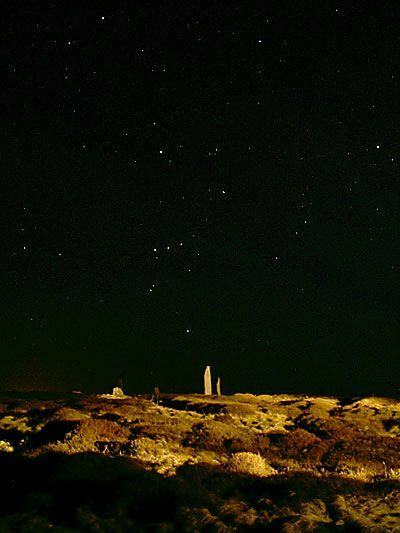 But at the end of the day, even if Orion and Orkney’s best-known Neolithic monuments have absolutely no connection, the Ring o’ Brodgar remains one of the finest, and most atmospheric, places in the county to view the constellation’s procession across the winter sky. Sigurd Towrie writes widely on archaeology and its links with history and folklore, both in The Orcadian, of which he is news editor, and on the Orkneyjar website, which is dedicated to preserving, exploring and documenting the ancient history, folklore and traditions of the islands.